Daily Express Super Book of Racing Cars from 1956. Homepage. This page: A small Daily Express booklet describing Sports and Racing Cars seen on track in 1956. The Super Book of Racing Cars. 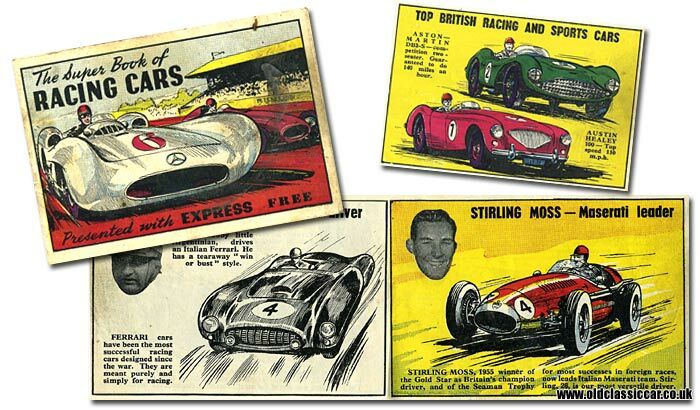 This small booklet, measuring 5ins x 3.5ins, is titled The Super Book of Racing Cars, and was a free giveaway with the Daily Express newspaper. The cover shows a Mercedes Benz W196 streamliner, a car that featured (both as an open single seater, and in enclosed form) in races during 1954 and 1955. In the 1950s, this paper's name was a regular sight at race meetings across Britain, as they sponsored a number of the larger events. Inside the front cover is an illustration of drivers undertaking a "Le Mans" type start, running across to their cars as a Daily Express sports car race at Silverstone gets underway. Within the pages of this slim booklet are both black & white, and colour, drawings of many contemporary single-seaters and sports-cars, along with background information on the headline drivers that could be seen on British and Continental circuits. Early racing cars also feature, the earliest of all being a 1902 Panhard 10, followed by the Hutton Little Dorrit of 1908, a 4.5 Litre Vauxhall (1919), an Alvis Super Sports (1924), and a Brooklands Riley 9 (1929). A curious-looking Aston Martin of 1948, winner of the Belgian 24 Hours race, is also illustrated. Better known is the C-Type Jaguar of 1953, winner at Le Mans at a speed of 105.84 mph. Many British cars make an appearance, with one page given over to an illustration of a 4.5 Litre Bentley at speed, built in 1928. "A triumph of British engineering" we're told. Facing this is the first of the colour pages, this one featuring two popular 1950s' sportscars - the Aston Martin DB3S - "Guaranteed to do 140 miles an hour", and the Austin Healey 100, capable of 110 mph. Other great cars of the mid 1950s included the Triumph TR2 ("cheapest of the 100 mph cars"), the 2.5 Litre Vanwall, the Cooper-J.A.P. 500 racer, and the MG (TD) Midget. The centrepiece of the leaflet is given over to a famous land speed record car, namely John Cobb's 394.197 mph record breaker. This streamlined machine incorporated two Napier Lion engines, one driving the rear wheels, the other the forward pair, it's driver sitting ahead of the front wheels, beneath a streamlined cockpit cover. Silverstone was one of several former airfields that had been adapted to motor racing duties after WW2, and a two page diagram showing the circuit, it's corners, and the original runways, is included, useful if you were planning to attend a race there. The wartime dispersal areas are also shown on the illustration. The majority of British cars featured in this leaflet were a success, but one colour illustration shows a car that, while technologically very advanced for its day, never fulfilled the great expectations that were laid upon it - the BRM V16. An astonishingly complicated car, it made a fantastic noise when it was running and did win some races, but never received the glory that it's designers, and backers, desperately hoped for. It made its public debut at the Daily Express International Trophy meeting at Silverstone in 1950. Two cars were due to start, but in the end only one made it to the grid, on the back row. The flag dropped, driver Raymond Sommer dropped the clutch, and the car promptly sheared a rear half-shaft joint. The crowd were unimpressed, and threw coins at the motionless car. The great hope for British motor racing was beginning to look like a white elephant. Two races at Goodwood later in the year would see the car win, but unreliability would continue to dog the project. Several toy manufacturers produced a diecast version of the V16 BRM, including Crescent. In many peoples' eyes, Juan Fangio was the best racing driver of all time, and he is honoured with a mention in this little book. Froilan Gonzales, charmingly referred to as a "tubby little Argentinian", drove with a "..
tearaway win or bust style" whereas Moss, shown driving a works 250F Maserati, "is our most versatile driver". Mike Hawthorn, a "high spirited giant", is illustrated driving a Jaguar D-Type. Sadly just three years after this booklet was issued, in January 1959, Mike would have a fatal road accident while driving his BRG 3.4 litre Jaguar, registration VDU 881. His celebrations over winning the 1958 Formula One World Championship, at the wheel of a Dino 246 Ferrari, would prove to be shortlived. The rear cover of The Super Book of Racing Cars announces the imminent arrival of another free giveaway, The Super Book of Modern Aircraft - another one worth keeping an eye out for.